A customer contacted me to ask how he could watch the security camera connected to his Axis IP / network video server on his TV. 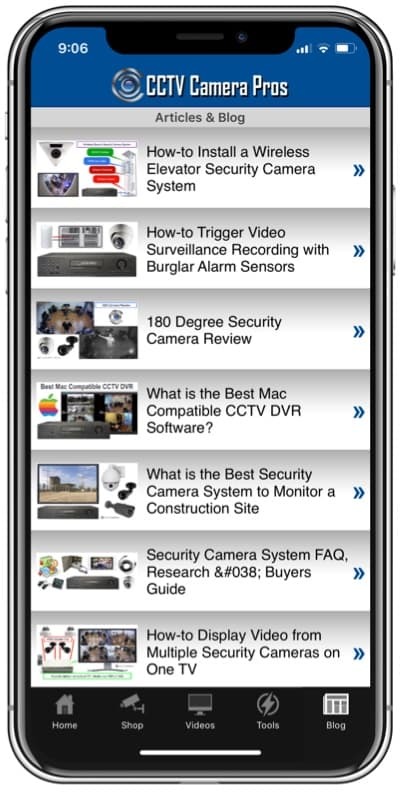 Here is the conversation and recommendation from CCTV Camera Pros. IP video address of the camera without using an iphone or android tablet to mirror it? In my setup, I have the analog cctv cameras run to an IP video server (Axis P7214) which then puts the video on the home network as IP video. Then, my dvr security software that runs on a computer, gets the video from the IP address, example: 192.168.x.x:(port)xxxx and records it. Can the AppleTV or Chromecast be setup to access the direct IP address on the home network, and show it on my tv? Again, I don’t want or need any iPhone or Android tablet to be in the middle of this. Here is my response to the customer. Thank you for reading my article and for contacting me with such great questions. I wish Apple TV or Chromecast could be used to watch security cameras without any dependency on an iOS or Android device. Unfortunately, when you encode your CCTV camera video with that Axis server and turn it into IP video, there must be some type of IP client App that received the digital video data and knows how to decode it to be display on your device (iPhone, iPad, Android mobile), then your device casts the video to the TV. Without the mobile app, that setup does not work. Maybe in the future, we can make apps directly for Apple TV and Chromecast. With a direct analog signal from your CCTV cameras (without using the Axis video server), you can actually receive the native analog video signal directly for display on your TV, without using any additional hardware or apps. However, you are required to run a coaxial cable to the TV that you want to watch your security camera video on. You can read detail about connected a CCTV camera direct to a TV here. The AppleTV and Chromecast method that I documented was for people that absolutely can not run any wires. You can use a composite video input on your TV, the old style ones with left / right audio channels and a yellow RCA video input. The yellow video input can take a signal directly from a CCTV camera. If your TV does not have a composite RCA input, there are RCA composite AV to HDMI Converters available. Using this type of setup, you simply switch your TV input to the composite input when you want to view your camera(s). If you want to display multiple security cameras on a TV, you meed to connect the cameras to a multiplexer or DVR that has a spot monitor output. Then you can still use a single coax to your TV to display multiple cameras views on the screen at once. 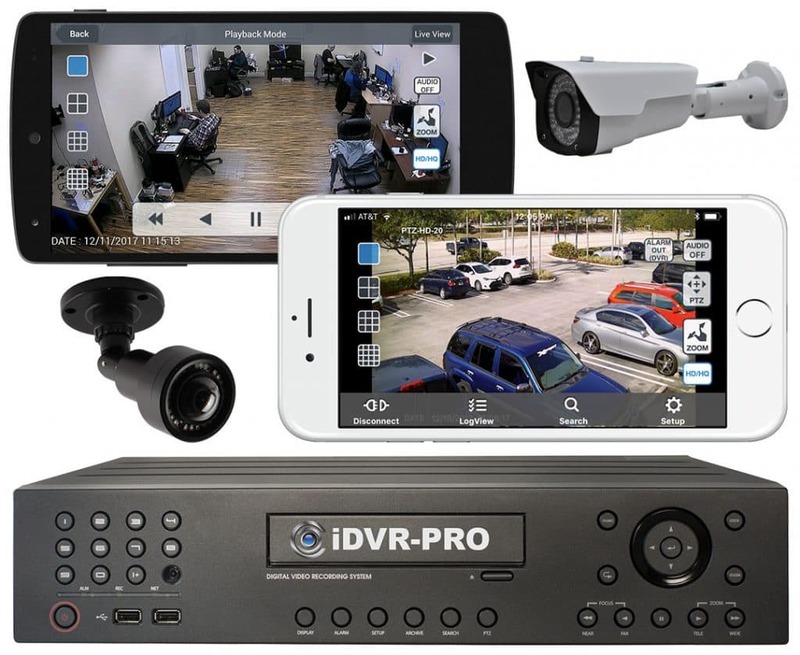 You can also have the DVR, quad video processor, or multiplexer (if you have more than 4 cameras) display a single camera view that pauses between displaying a series of camera views. Here is a link to a quad processor for your reference. This is a multiplexer that handles up to 16 cameras. 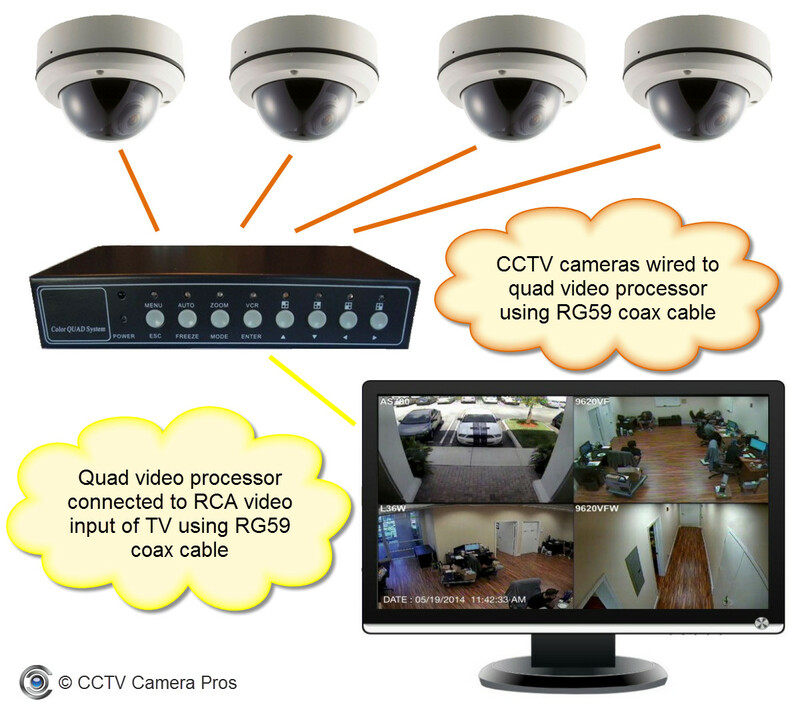 Here is information on how a spot monitor works on a CCTV DVR. Sorry for the long answer, but I figured that I can reuse this explanation to explain to others on our website as well. I hope it is useful to you. This topic was modified 3 years, 9 months ago by Mike Haldas.